Count them: 52 sculpted and inlayed 18K gold acorns in this, the best ever of Petersonâ€™s work. Chris Meyer engraved the back blade, back spine, blade, and front and back bolsters. Today the engraving and gold would cost more than the knife. A thin gold inlay surrounds the entire handle and blade. Black Lip interframe inlays. 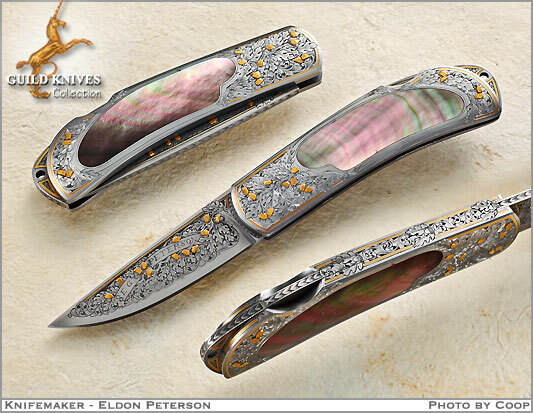 There may not be another knife by Peterson and Meyer of higher detail and quality on the planet.